There are several reasons why the UK electrical generating infrastructure hasn’t collapsed as demands have continued to rise. The push to install renewables (whether solar PV or wind turbine or one of the lesser well known technologies) is well documented. What few realise is that recent initiatives to improve energy efficiency have ‘freed-up’ generating capacity and helped to maintain a safety margin. It is widely reported that investing £6bn in UK energy efficiency initiatives would have the same effect in terms of generating capacity as building four Hinckley C nuclear reactors. That’s a staggering fact when you consider that the Hinckley C reactor is an unproven concept and one we should be wary of. Furthermore, there are a number of energy efficiency improvement techniques available that are based on proven (not new) technologies. Across Europe, energy efficiency is improving. The European Commission’s Joint Research Centre recently published its record of energy consumption reductions across Europe from 2000 to 2014. The report concludes that final energy consumption (in the region) fell substantially across 28 countries. The UK was amongst the most successful in terms of energy reduction. Whilst GDP for the UK has risen to three times higher than 50 years ago, energy consumption has dropped by 15.5% across domestic, commercial and industrial users with industry and commerce experiencing the most impact and benefit. Whilst the signs are positive, there are some negatives. One of these is the apparent ‘failure’ of energy initiatives such as ESOS. Currently, the Energy Agency is said to be investigating 1,700 organisations for failing to audit and report to the Energy Saving Opportunities Saving deadline of January 29th 2016. Other programs such as the National Grid’s demand response have yet to really make an impact and energy storage both at the grid and domestic levels is still at a trial stage. There are currently 453MW of energy storage projects planned or in development so far in the UK with most battery-based (on top of an installed base of 3.23GW to August 2016) and this is in addition to the 200MW of ‘enhanced frequency response’ contracted by the National Grid. From a building point of view technologies are also changing. We are seeing the Internet of Things (#IoT), data logging and intelligent metering being used to connect devices. In time this could lead to wide scale national demand response and smart metering solutions bur for now any energy saving benefits are purely internal in terms of cost reduction and external in terms of reduced demands placed on the grid. Traditional Building Management Systems (BMS) are also developing to keep pace with these changes. BMS are now Building Energy Management Systems (BEMS) whose goal is to encompass the additional need to monitor and control energy usage. A BEMS can quickly identify where energy is being used less than efficiently and actions taken to rectify this. The success of such a system relies on sound monitoring and control principles including branch and sub-metering and the implementation of the latest energy efficiency devices. Power quality is another issue to consider when it comes to energy efficiency. There is little doubt that rapid development of the renewables industry has also led to a decrease in the quality of power generated and distributed within the UK’s national grid. 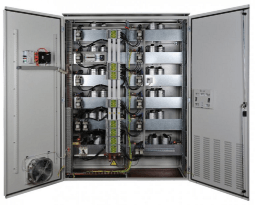 In areas of dense renewable power connections, high mains voltages can be recorded leading to potential investment opportunities in voltage optimisation. Harmonics can be a further cause for concern that can lead to expensive heat losses, increased energy consumption and damage to critical and sensitive loads. Improving a building’s power factor can also benefit an organisation and the wider UK power network. Power factor correction (PFC) is a well known energy saving technique known to large energy users and especially those on half-hourly energy metering. Power factor is a ratio measurement of the real power (measured in kilo-Watts kW) required to power a load compared to the apparent power (measure in kilo-Volt-Amperes kVA) required. The nearer the power factor (pF) is to Unity (1) the more energy efficient the load all Utilities aim for a power factor of 0.95 (95%). A poor power factor reduces energy efficiency, increases consumption and capacity demand and leads to higher energy bills and reactive power charges. In the UK it is not uncommon to find sites operating with power factors around 0.8. A site’s power factor is affected by the loads operating on it and for lower power factor sites such loads can include inductive loads: electric motors, pumps and fluorescent lighting. A site operating a large number of inductive loads requires more apparent power to be generated to power the loads and this difference whilst measured in power factor is charged as Reactive Power (kVAR). Reactive Power is the ‘non-working’ power element. If a site has a power factor of 0.8 this means that 20% of the power drawn is non-working. Power factor correction systems use electrolytic capacitor banks to raise power factors and reduce the kVAR element. The systems sit in parallel to the mains power supply and are either built into the LV switchboards or supplied as standalone systems. Power factor correction is therefore a relatively simply solution to fit and an easy to maintain device. The operating life is dependent on the working life of the individual capacitors fitted. PFC systems are sized according to the supply phases (single or three phase), load size and power factor improvement required. It is important to monitor and maintain a PFC system. Whilst a power factor correction system can fail safely (as they are not fitted in series), without monitoring, a capacitor or system failure may only become evident when the next electricity bill arrives. In the UK, the BEAMA Capacitor Manufacturers Association (BCMA) estimates that installation of power factor correction systems has helped to significantly improve energy efficiency and reduce energy consumption. Potentially PFC systems have removed the need for an extra 2TWh (Terra-Watt-hours) of electricity generation in the UK and reduced CO2 emissions by 1.2million tonnes. Power factor correction is more than a power quality improvement technique. Fitting a correctly sized PFC system will improve a site’s power factor, increase energy efficiency and reduce electricity bills. For sites approaching the limits of their incomer, PFC can also free-up capacity for further expansion and at a far lower cost than asking the local DNO to install a higher-rated supply. As part of larger UK-wide energy efficiency improvements, power factor correction can play a role in reducing the need for extra generating capacity, at least in the short term. For more information on power factor correction and our energy efficiency improvement services please contact the Eco Power projects team on 0800 612 7388.